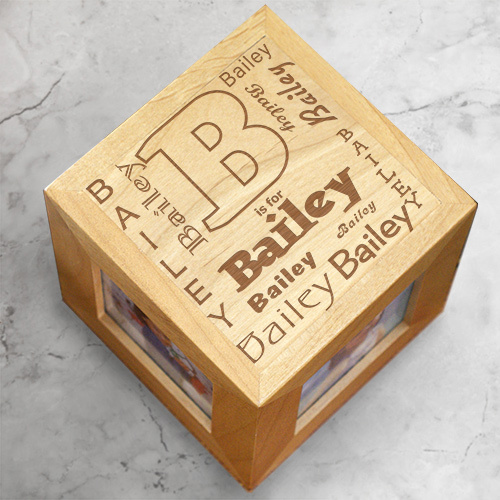 A creative way to show off your child's name and photo's is using this engraved Personalized Photo Cube. We will skillfully engrave the top of this photo cube with any initial and any name. We will then engrave this photo cube with the beginning letter off the name plush their first name repeated all over the top of the block. 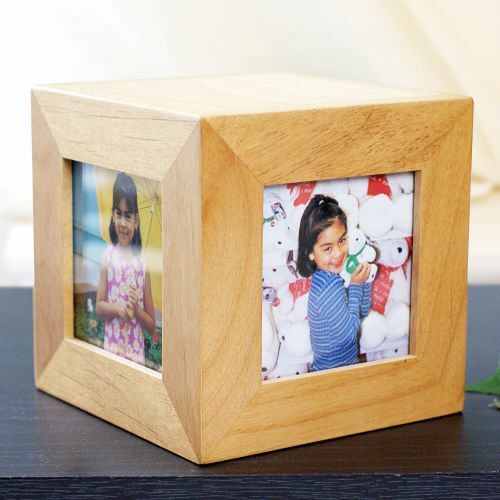 I loved the personalize photo cube...it was purchased for a baby, but she can display it in her room for years!!! She has an unusual name, so the personalization was wonderful! An Engraved Photo Cube Keepsake is the perfect personalized gift idea to give to that special person in your life. Your best friend will love this gift & cherish it for years to come. Our Engraved keepsakes make unique gifts for a Personalized Birthday Gift, Bridal wedding shower gift or just because. A Personalized Photo Cube is also great engraved gift idea for Valentine's Day, Sweetest Day, Weddings, Anniversaries or any Romantic Gift Giving Occasion. Get all your Personalized Photo Cube Keepsake Gifts at GiftsForYouNow.com.